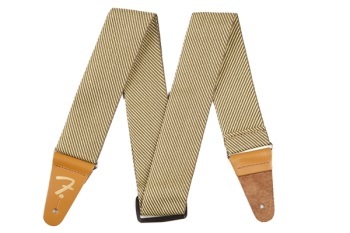 Make a bold statement with the timeless look of Fender tweed, thanks to this lightweight yet durable 1-7/8” guitar strap. -Fully adjustable length (44”-49.5”) provides a versatile fit for most players. -Classic tweed material imparts a vintage-style vibe. -Embossed gold Fender “F” logo on reinforced leather ends adds an extra cosmetic touch and uncompromised durability.